INDIANAPOLIS (October 16, 2013) — Klipsch, a leading global speaker and headphone manufacturer, announces today the launch of its limited edition Indiana Pacers Image® ONE headphones. Catering to on-ear enthusiasts and commemorating the brand’s partnership with the NBA team and brand ambassador Roy Hibbert, the headphone maintains the same high-quality sound signature while giving fans a unique piece of memorabilia. The Indiana Pacers Image ONE headphones will be unveiled at Banker’s Life Fieldhouse on October 23 at 5 p.m. The public is encouraged to join both Klipsch and the Indiana Pacers for a product introduction ceremony that will take place at the Home Court Gift Shop. Onsite for the event will be the team’s star center and Klipsch brand ambassador Roy Hibbert, who will personally greet fans and sign their headphone purchases. "Klipsch is like family to me, I am very excited to help them launch this exclusive product for our Pacers family,” said Hibbert. “The fans will be able to enjoy high quality sound while at the same time supporting our team." Showcasing blue and gold finishes that mirror the team’s jersey design, the on-ear headphone offers listeners comfortable ear cups that feature leather-wrapped memory foam as well as a three-button remote and mic for full music and voice control on select Apple products. Included with purchase are a protective travel case, ¼-inch and airline adapters, and two-year warranty. 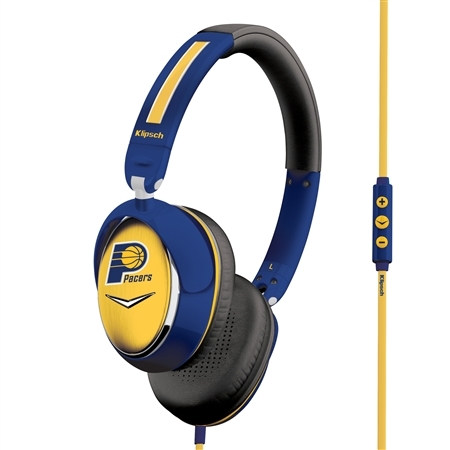 The Indiana Pacers Image ONE headphones will retail for $149.99 (U.S. MSRP) and be available for purchase starting October 23 at Banker’s Life Fieldhouse’s Home Court Gift Shop and PacersGear.com.